China's air force will soon commission the J-10B fighter jet, the most advanced military aircraft the country has ever developed on its own, information released by military observers show. Several pictures showing 14 of the planes lined up outside an unidentified aircraft factory have been circulating on military websites. Experts said their gray paint scheme indicates that they will soon be delivered to the People's Liberation Army air force. Though no one has claimed ownership of the pictures, they are believed to have been taken by Chinese aviation enthusiasts in late December or early January. "Considering that the paint scheme is being used by the PLA air force and recent leaks that the aircraft has concluded its tests," Wang Ya'nan, deputy editor-in-chief of Aerospace Knowledge magazine, said on Wednesday. "I think these J-10Bs will join the air force within a short period and will pair with the heavy-duty twin-engine J-11, and with our fifth-generation stealth fighter, the J-20, which is expected to enter service within a few years," he said. "It is also possible and feasible that the J-10B's upgraded version will be chosen by the navy to serve on an aircraft carrier or amphibious assault ship," he added. 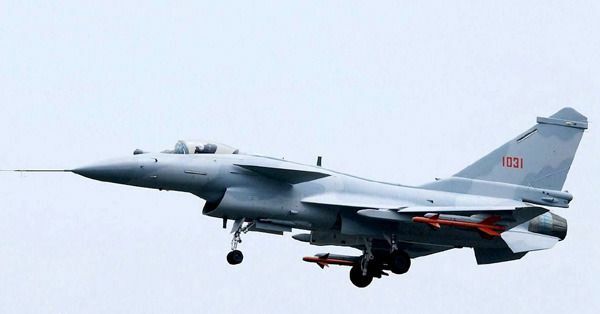 Du Wenlong, a senior researcher at the PLA Academy of Military Science, said the J-10 family will be developed into a multitask platform that can perform air-to-ground strikes and also can be used in sea-based operations. The J-10B is an improved variant of the J-10A, which is manufactured by the Chengdu Aircraft Industry Group, a subsidiary of the State-owned giant Aviation Industry Corp of China. Western military sources said the jet had its first flight in December 2008, and mass production started in 2013. A publicity officer at Aviation Industry Corp's Beijing headquarters who asked not to be named said he could not confirm information about the J-10B, citing corporate policy. Zhang Zhaozhong, a military expert at the PLA's National Defense University, said the new fighter has "an increase of at least 30 percent in overall capability" compared with its predecessor. He added that the warplane can compete with any fourth-generation fighter jet in Asia. The aircraft has a maximum takeoff weight of 19 metric tons and can carry a payload of up to 8 tons. Its combat radius can reach to about 1,000 kilometers, Zhang said.